"One Round" Jack is a boxer who fights in bazaars. He is engaged to Nelly. Without revealing his true identity, the Australian champion Bob Corby, who is falling in love with Nelly, challenges Jack. "One round" loses and Bob, who wants to be close to Nelly, hires Jack as his sparring partner. A short time passes until Bob and Nelly run away together. Jack is now in training for his revenge. He challenges Bob in the Albert Hall. Hitchcock had joined British International Pictures (BIP) in June 1927, shortly after completing Easy Virtue for Gainsborough — John Maxwell's offer of a higher salary (£13,000 per annum), more creative freedom and better studio facilities was enough to tempt the director away from Michael Balcon's studio. 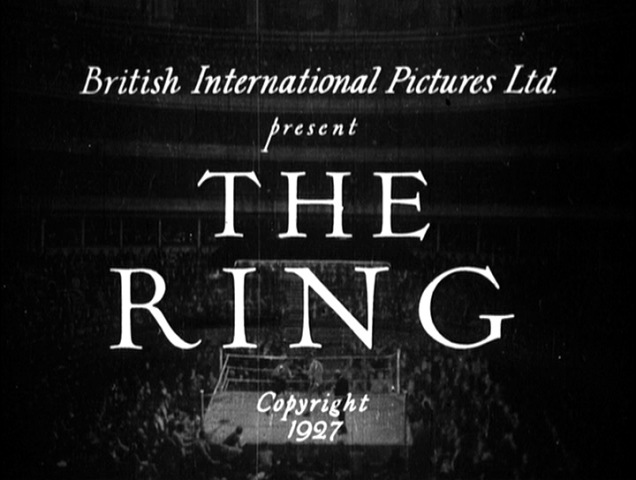 As early as April 1927, Hitchcock had been talking about his idea for a film based around the boxing and a scenario was already complete prior to joining BIP. According to Patrick McGilligan, Hitchcock had more control over casting than he had at Gainsborough and hand-picked Lillian Hall-Davis, Carl Brisson and Ian Hunter as the three leads, and Gordon Harker as the Brisson's trainer. Respected and experienced cameraman Jack Cox, an expert at "in camera" effects such as dissolves, overlays and double-exposures, was selected as cinematographer and would go on to work with Hitchcock on all of his BIP films. Filming took place during July and August 1927. With a larger budget than before, the fairground used in the opening section of the film was built on the lot at Elstree Studios and hundreds of extras were hired. The film's climax allowed Hitchcock to experiment with the Schüfftan process to seemingly stage the scene within the Royal Albert Hall. Italian-born artist Fortunino Matania, who specialised in creating life-like crowd scenes, worked on the film. With impressive speed, the film was edited in early September and previewed to the trade towards the end of the month. The Western Morning News hailed it as "the first of a new series of British films, and is a very complete answer to the pessimists who assert that no good films are made in England [...] Hitherto British film directors have too often imitated, with little success, the work of their American rivals, but Alfred Hitchcock has at last got right away from the beaten track." The Guardian review noted Hitchcock's "unusual resource and inventiveness in camera work, and a flair for the comic, pull him through easily, with a series of neat effects" and concluded by saying, "If British films as a whole can rise to this standard, the masterpieces will not be lacking, and, quota or no quota, the new industry will be firmly established". Similarly, The Times reported that the "opening scenes at a fair are remarkable for variety in photographic angle and for imaginative use of light" and that the "film as a whole marks a considerable technical advance". You have set the standard not only for your own company but for every British producer, and if future British films only approach "The Ring" in quality, we need have no fears for the ultimate success of the entire producing industry in this country. Our first hope is that you will long continue to make films in this country, because the producing industry — which owes you a debt of gratitude — can ill afford to be without your talent. With Jack Cox's skill with special effects and unusual camera setups, Hitchcock was able to create a surprisingly expressionistic British film which American film critic Jonathan Rosenbaum described as "the most Germanic in style of Hitchcock's silent films". As part of the "Save the Hitchcock 9" campaign, started in 2010, the British Film Institute undertook a full restoration of The Ring. As part of their research, the BFI discovered that the only surviving negative (an export version from the French archives) is, in fact, mostly made up of alternative takes of each scene. Instead, acetate duplicating positives of both The Ring and The Farmer's Wife from the 1960s are now the earliest-generation sources of the original films. ↑ Standard Hollywood practice at the time was to use two side-by-side cameras to generate two near-identical negatives (one being for export). However, BIP seem to have constructed their export negatives using the unused alternative takes of each scene.